Helloooo Monday! How was your weekend!? Mine was mostly uneventful… except that I sliced off part of my thumb (MOM DON’T WORRY IT’S JUST A CUT) making more sauerkraut, I bottled my first batch of homemade kombucha (instructions to come eventually! ), ate delicious Cuban food, and successfully survived the heatwave that is now (YAY!) over. Also I listened to “can’t feel my face” about ten thousand times. AND I scored an ENTIRE HUGE BOX OF PIZZA for $5. NBD. It pays to stay up late! Now onto the week! AND TACOS! It’s been a while since we’ve talked about tacos. I mean, they’re still a near-daily part of my life (fo reals. the frequency with which I eat tacos is alarming), but they haven’t made it on the blog in ages! These suckers are worth it: CHERRY PICO DE GALLO OMG! All that means it that I took fresh cherries and mixed it with tomato, lime, and onion. Easy! Last week I tried to go to a taco place near my house, which I hear has good tacos AND good happy hour. I was like “oh sweet, $1 tacos instead of $2.50 tacos. I’m in!” UNTIL I arrived at 5:30 (which is a totally normal happy hour time, right? Right.) and learned that happy hour is from 3-5. Insert flatline face emoji here. THREE TO FIVE!? Come on, guys. Not cool. I know for a FACT that it used to go until at least 6, maybe even 7. I felt BETRAYED. And then I paid $2.50 per taco anyways like a good consumer. But then I came home and made THESE the next day! YEAH! 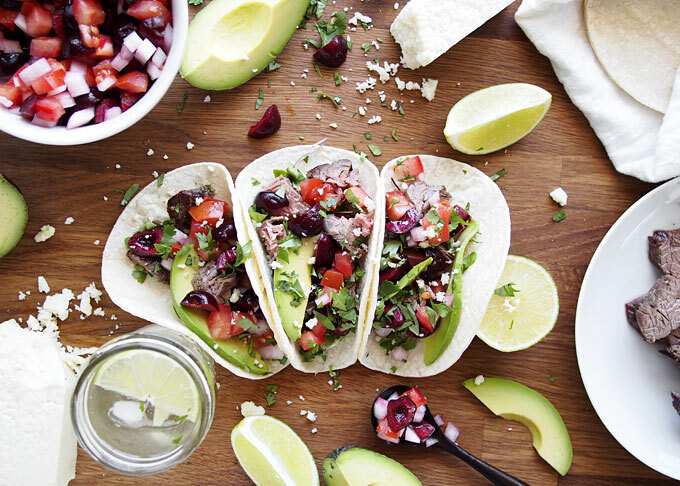 Originally I thought these were going to be vegetarian tacos — black beans and cherry pico. That sounds pretty good, right? But then a friend suggested steak and I was like “oooh duh that sounds like heaven” and now here we are. I rubbed the steak with a tiny bit of brown sugar, and quite a bit of garlic, and let it sit for a few hours before broiling it. If you have a grill, grill it up! Cook it however you see fit. I then let it cool for 10 minutes and picked it apart — it was really tender and easily broke into bite-sized pieces. THE BEST. Also: cojita. Don’t overestimate the power of cojita. THAT CHEESE IS FO REALS! I’ve actually been eating it alone in big clumps instead of actually *using* it … but don’t tell anyone that. It happens. It’s a tough life being a cheese-lover. Rub both sides of the steak with the brown sugar, garlic, and salt & pepper. Cover and refrigerate for at least 2 hours. While the steak is marinading, make the pico. 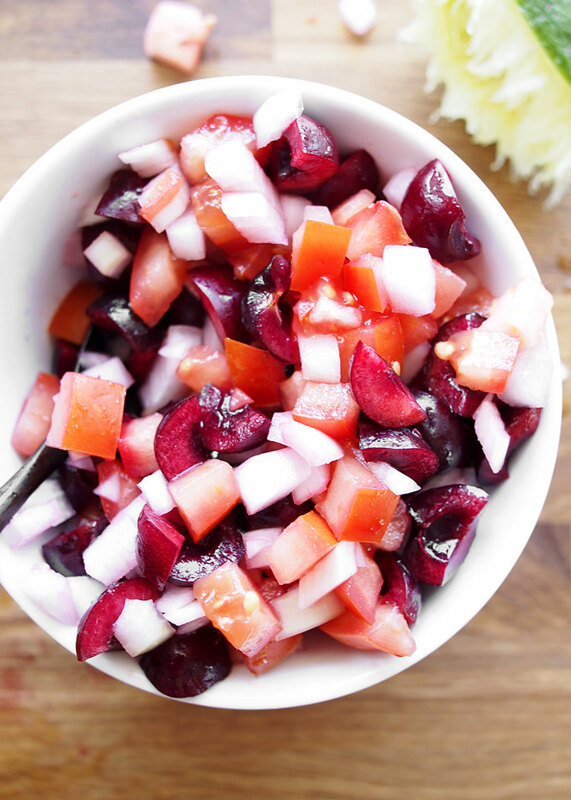 Combine the cherries, diced tomatoes, diced onion, and the juice of one lime. Mix and set aside. When you’re ready to cook the steak, cook it to medium-doneness with whatever method you prefer. 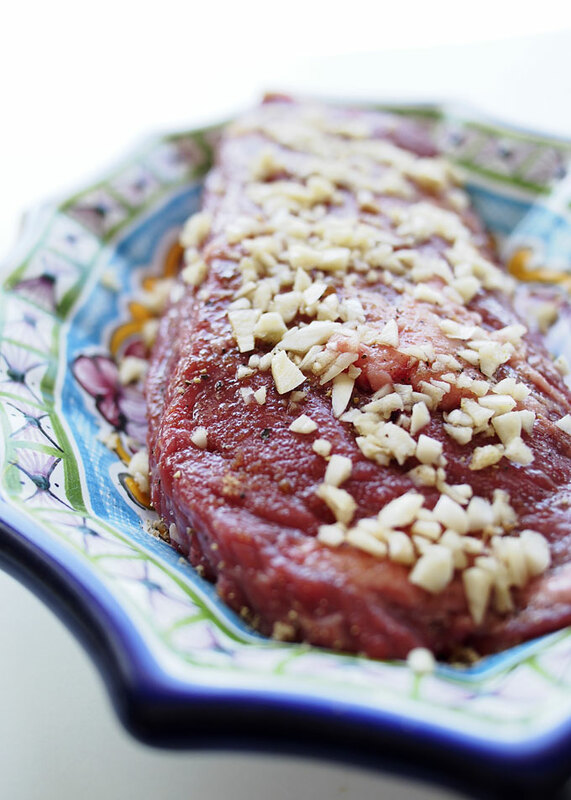 If you’re broiling, put it on a lined baking sheet and broil on the top rack of the oven for 4-5 minutes on each side. When you’re done cooking, let the steak rest for 10 minutes before cutting it into small pieces. 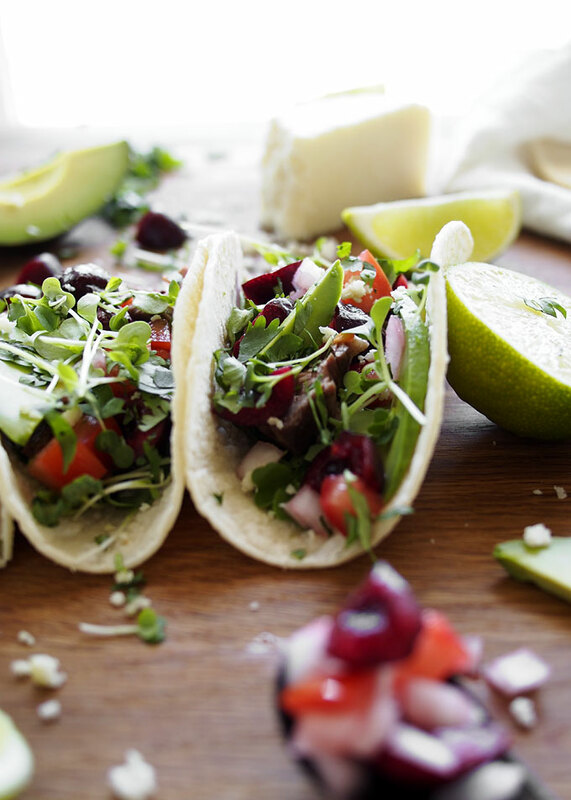 To assemble the tacos, fill each tortilla with microgreens, steak, and cherry pico before topping with fresh cilantro, crumbled cojita cheese, sliced avocado, and more lime juice. 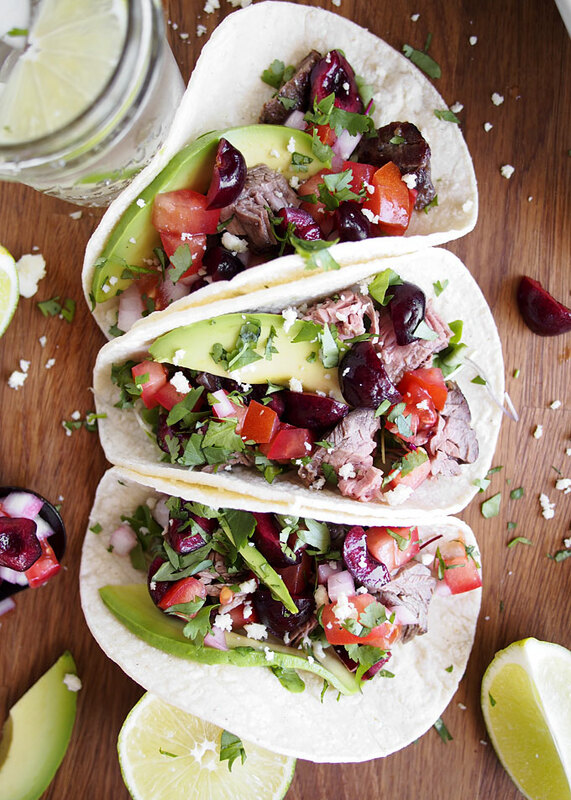 Love the idea of cherries in tacos! And seriously agree on the happy hour timing, why why why until only 5:30?! That is mean! RIGHT!? So mean. Cherries are going in pretty much allllll of my food these days! I want berry season to last forever! Oh yum, cherry pico de gallo?! I’m definitely on board. 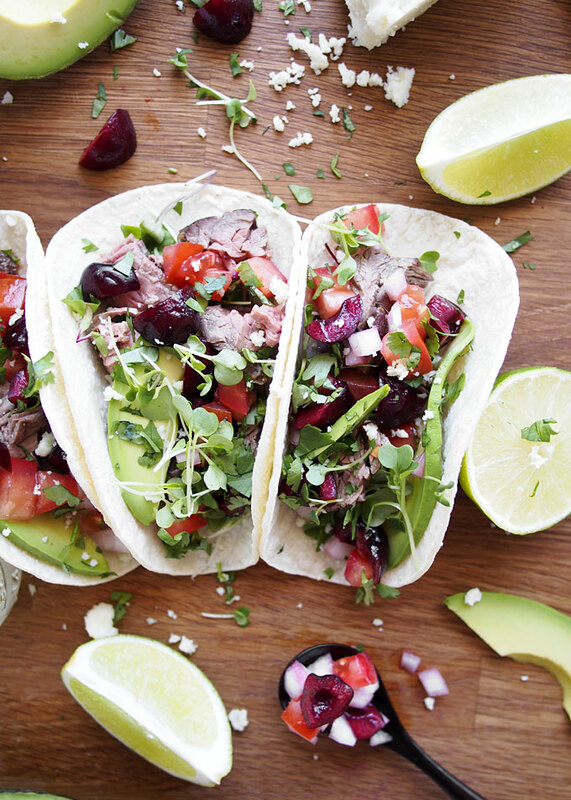 These tacos look super flavorful and fresh. I hope your thumb is all better!